Dubbed the Indiana Jones of wildlife science by The New York Times, Alan Rabinowitz has devoted—and risked—his life to protect nature’s great endangered mammals. He has journeyed to the remote corners of the earth in search of wild things, weathering treacherous terrain, plane crashes, and hostile governments. Life in the Valley of Death recounts his most ambitious and dangerous adventure yet: the creation of the world’s largest tiger preserve. The tale is set in the lush Hukaung Valley of Myanmar, formerly known as Burma. An escape route for refugees fleeing the Japanese army during World War II, this rugged stretch of land claimed the lives of thousands of children, women, and soldiers. Today it is home to one of the largest tiger populations outside of India—a population threatened by rampant poaching and the recent encroachment of gold prospectors. To save the remaining tigers, Rabinowitz must navigate not only an unforgiving landscape, but the tangled web of politics in Myanmar. Faced with a military dictatorship, an insurgent army, tribes once infamous for taking the heads of their enemies, and villagers living on less than one U.S. dollar per day, the scientist and adventurer most comfortable with animals is thrust into a diplomatic minefield. As he works to balance the interests of disparate factions and endangered wildlife, his own life is threatened by an incurable disease. The resulting story is one of destruction and loss, but also renewal. 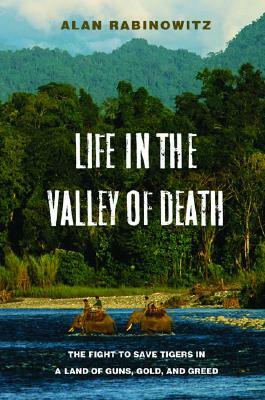 In forests reviled as the valley of death, Rabinowitz finds new life for himself, for communities haunted by poverty and violence, and for the tigers he vowed to protect. "As a general rule, books by saints are best avoided... The exception to this rule: Alan Rabinowitz. ... Suffice it to say that the guy's halo is green, bright and fully deserved. But he's also a hell of a good writer, which is why Life in the Valley of Death is anything but another desperate dispatch from a shrinking corner of the wild." "Life in the Valley of Death is not your typical chronicle of rescuing wildlife. Rather it's a clear-eyed rendering of conservation's unruly, dangerous, and chaotic side." "Rabinowitz deserves credit for a political courage no less real than his physical bravery, for being willing to sit down with the devil, occasionally, to save a tiger." "Life in the Valley of Death is the triumphant story of his toughest job to date...Rabinowitz had to gain the cooperation of the ruling military junta and navigate an elaborate bureaucracy. That he succeeded testifies to his modesty, patience, and ability to persuade powerful people of the importance of saving tigers." "For 20 years, he has traveled the world, imploring the power elite of democracies and dictatorships to dedicate large parcels as reserves for these imperiled felines." "By engaging Myanmar's ruthless military dictatorship, Alan Rabinowitz has pulled off extraordinary feats for tiger conservation. His is a story of drawing lines—geographic, political, and moral." "The story of how this lofty goal is accomplished makes for absorbing reading; this very personal account of the nuts and bolts of international conservation will resonate with lovers of the earth's last wild places." "Engaging. . . [Rabinowitz] is a man on a mission and we are not really surprised when that mission ultimately proves successful." "In an inspiring, personal book, Rabinowitz recounts his struggles to protect the tiger population in Myanmar, formerly Burma. . .Ultimately, his book is about challenges, possibilities, and hope." "Alan Rabinowitz is a hero of mine. He combines the courage and initiative of nineteenth-century explorer with the knowledge of a modern wildlife scientist, thereby achieving solid conservation in some of the most remote and critical parts of the world. Life in the Valley of Death represents a high point in a remarkable life." "I could not put down this remarkable book. Alan Rabinowitz's personal journey is every bit as moving and inspiring as is his passionate and courageous battle to save the world's most endangered great cats. We need the mystery and majesty of wild things and wild places. I am convinced that the efforts of Alan and his colleagues will have a profound effect on our collective soul." "Move over Indiana Jones—Alan 'Burma' Rabinowitz is a great man with a great vision. His dramatic story of hope and heroism facing tangled jungles, political intrigue, and a personal battle with cancer will have you on the edge of your seat, cheering for both him and the tigers." — Sy Montgomery, author of "Spell of the Tiger" and "The Good Good Pig"
"By turns sad and uplifting, Life in the Valley of Death tells the amazing tale of Alan Rabinowitz's courageous and spirited efforts to protect Burma's (Myanmar's) remaining tigers and establish the Hukawng Valley Reserve. It is hard to imagine a more passionate or exciting account of today's conservation challenges, or a more thoughtful rendering of life, death, and politics in Burma's most remote corners." — Thant Myint-U, author of "The River of Lost Footsteps: A Personal History of Burma"